From the Baldwin County Courthouse, go east on Hancock for 2 blocks. Turn right (south) on Elbert St. Cross Fishing Creek and immediately turn left on Underwood. Go to Nelson Rd and turn left. Go 20 yards on Nelson Rd. and note the entrance to a property on the left. Gain permission to go through the entrance and follow the dirt road for slightly more than 0.2 mile. Grave is on the left, 100 feet from the road on the left side of a field and not visible from the road. 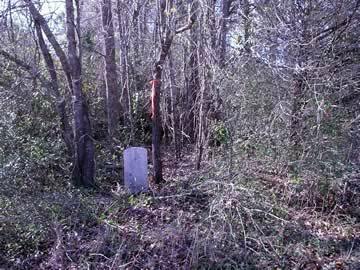 The military marker still remains at the original gravesite, even though the original gravestone has been moved. b. Petersburg, Va., per marker in Memory Hill Cemetery. It is likely she is buried in this cemetery and only the stone was moved to Memory Hill.